OS Explorer Map 131, 'Romsey, Andover & Test Valley. Stockbridge & Ludgershall'. GPS Co-ordinates: N51 08' 80" W001 54' 90"
To see: not much nearby. 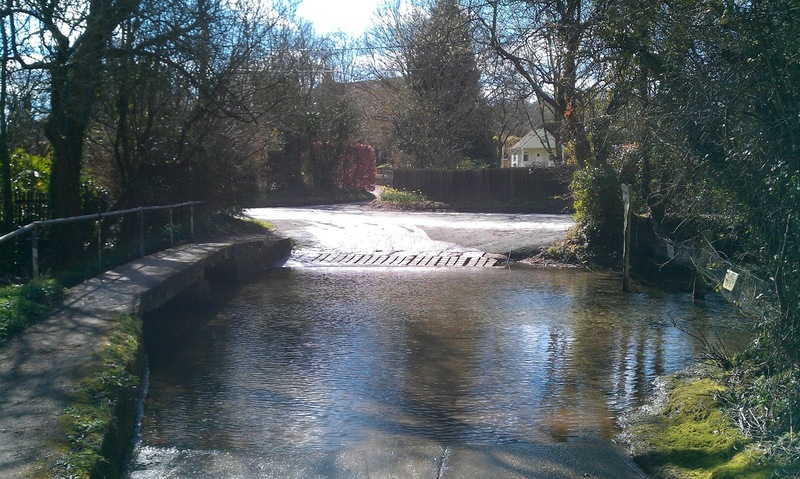 This is a shallow ford over the Wallop Brook. Before driving this ford (as you should any other), assess its depth. The water in the Brook is usually crystal clear, but if it's not don't be shy of wading in with a measuring stick. As well as its depth of the water, assess the force exerted by it (the faster the stream, the more likely your car is to be washed away), and the nature and quality of the ford surface. Weight this against how likely you are to damage the watercourse, whether there is any evidence of damage from vehicles that have gone before, and make an informed and sensible decision whether to attempt a crossing. If there is even the slightest doubt, turn back. In this instance, the surface consists of concrete bottom with a footbridge across it's eastern side. Take it slow enough to avoid damaging the ford and your vehicle, but just fast enough to avoid stalling the engine.